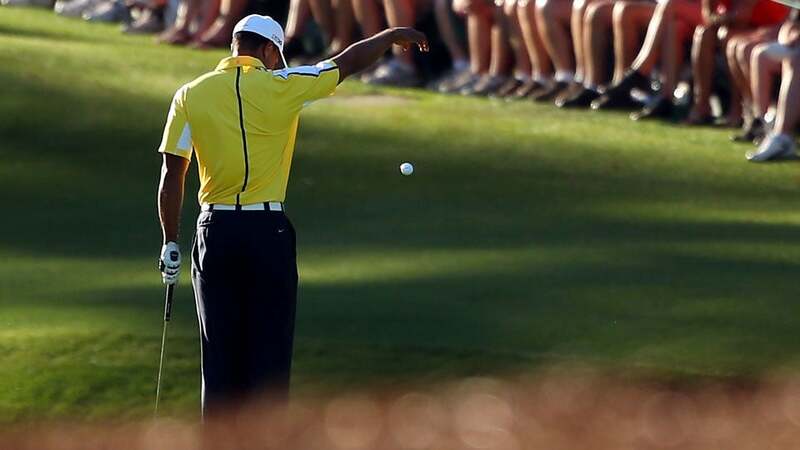 Tiger Woods' now infamous drop at the 2013 Masters might have cost him a shot at his 15th major title. It is one of the more tantalizing questions in modern sports history: where would Tiger Woods be today if his ball hadn’t hit the pin? Surely you remember the moment. It was late Friday afternoon at the 2013 Masters, and Woods was in the second-to-last tee time, playing through a golden twilight. On a day when the wind was swirling, he was tied for the lead and the only player in the field without a bogey. Four weeks earlier Tiger had reassumed his spot atop the World Ranking, a significant milestone on the long road back. Woods had rebuilt his life and golf game since his fall from grace in 2009; a win at the Masters would have completed the journey. After a poor drive at the 15th hole, Woods laid up and was left with 85 yards to a flag cut on the front left of the water-guarded green. He played a baby cut with his 60-degree wedge. The ideal way to attack that pin is to land the ball short and right of the hole and have it release down the slope, but Woods flew the shot a couple of yards too far. The ball struck the flagstick two feet up, caromed backward at about a 45-degree angle to the left, and rolled into the pond. Woods displayed little emotion, trudging toward the green to assess his options on where to drop for his fifth shot. Imagine for a moment his mental state: A 15th major title -- and perhaps the most important win of his career -- is within his grasp, and after hitting an almost perfect shot, he suffers one of the worst breaks of his life. It made sense when Woods later said, "You know, I wasn't even really thinking. I was still a little ticked at what happened, and I was just trying to figure, O.K., I need to take some yardage off this shot … So I went back to where I was and actually took two yards farther back and tried to hit my shot another two yards off of what I felt like I hit it." Here Woods was a victim of his hubris; he could have hit 100 balls from the previous spot, and it's highly unlikely he would have nicked the flagstick again. But in his mind he needed two extra yards to prevent lightning from striking twice. By moving back those two fateful steps, Woods violated rule 26-1a, which compelled him to drop "as nearly as possible" to the site of his previous shot. Thus began a farcical melodrama that consumed the tournament and left a lasting stain on numerous reputations. It came out the next day that the chairman of the Masters competition committee, Fred Ridley, had been alerted to the improper drop while Woods was still on the golf course. Ridley reviewed the footage but later told a fellow rules official it was “splitting hairs” to say Woods had committed a violation. He didn’t bother to discuss the situation with Tiger before he signed his scorecard following the round. It was only after Woods incriminated himself in a post-round interview that Ridley felt compelled to add a two-stroke penalty, but he did not disqualify Woods, despite howls of protest by fellow players and the media. Ridley acted under Rule 33-7, which states: "A penalty of disqualification may in exceptional individual cases be waived, modified or imposed if the Committee considers such action warranted." In this case, the exceptional circumstance was the chairman of the Masters competition committee bungling the review. With the retroactive penalty, Woods wound up with an 8 on the par-5 15th. Burdened by the controversy, he didn’t play his best golf over the weekend, finishing tied for fourth, four back of Adam Scott. Four strokes, of course, is the difference between what he almost surely would have made at 15 had his third shot missed the flagstick and the snowman that he actually ended up carding. What if Tiger had won that Masters? It would have provided a kind of validation that he desperately needed. He would have played with more confidence in the major championships, where his post-scandal vulnerabilities were most acute. Perhaps he wouldn’t have chased redemption so hard on the practice tee and in the gym, pushing his body to the breaking point. He surely would have stuck with Sean Foley and not wasted precious time on yet another new swing in a desperate attempt to recapture old glory. Of course, all we can do is speculate. In one of golf’s murkiest incidents, one thing that is beyond dispute is that Woods’ ball hit the flagstick. He was never the same again.